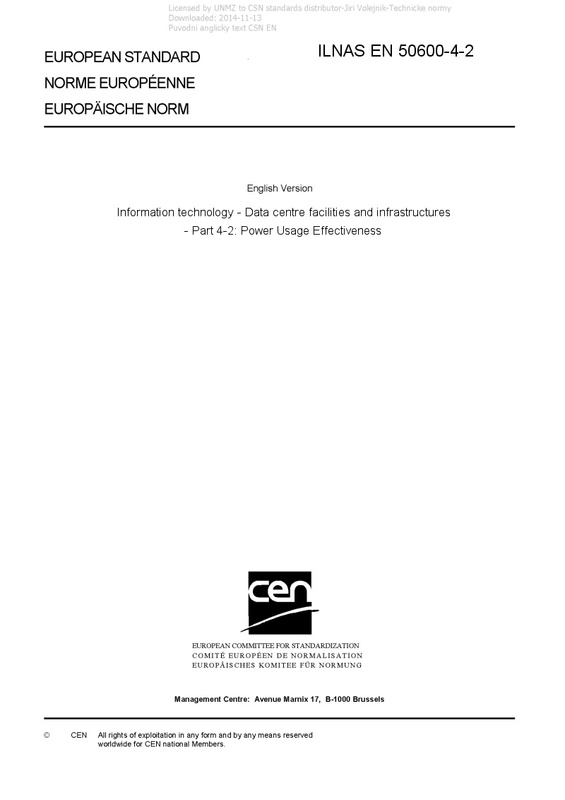 EN 50600-4-2 Information technology - Data centre facilities and infrastructures - Part 4-2: Power Usage Effectiveness - This European Standard specifies the Power Usage Effectiveness (PUE) as a Key Performance Indicator (KPI) to quantify the efficient use of energy in the form of electricity. NOTE See the Note 1 to entry in Definition 3.1.3. This European Standard: a) defines the Power Usage Effectiveness (PUE) of a data centre; b) introduces PUE measurement categories; c) describes the relationship of this KPI to a data centre’s infrastructure, information technology equipment and information technology operations; d) defines the measurement, the calculation and the reporting of the parameter; e) provides information on the correct interpretation of the PUE. PUE derivatives are described in Annex C.